A blouse with skinny jeans and heels has always been my go-to look for days I want that dressed up, casual vibe. It’s probably my favorite combo! Oh and this blouse is only $44!!!! When I first spotted it I actually thought it was Free People blouse (those are always over $150) so when I saw the price I was shocked and saw that it wasn’t FP but I was more excited at what a good deal it was! It also comes in a gorgeous ivory color too! I love this casual look for spring, the colors are perfect. It’s always exciting for find a great deal – that shirt def looks more expensive than it was! Also loving that beautiful bag and shoe combo, I wish that had that color in the lower heel! You’ve just given the idea to mix the olive green with lavender for unconventional was! I love how you always look so elegant in heels….I walk like an elephant in mine!! Absolutely love this look! You look gorgeous in olive green. Those shoes are just absolutely amazing too! 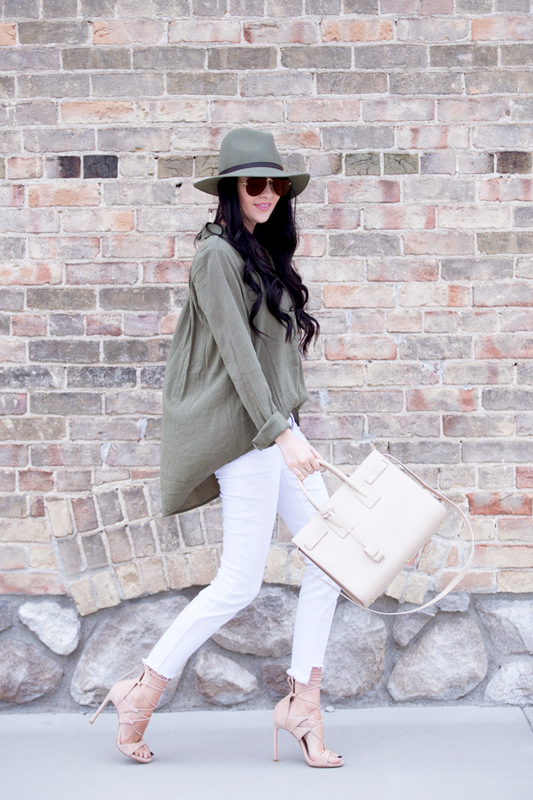 Love this casual look, so perfect for the spring weather approaching! And I am scooping up that top pronto, can’t believe it’s only $44!! Love this outfit! I’m all about army green during spring. This combo of white and green is just fabulous. I really like the look and fit of that top! The color is perfect as well! Casual but still chic! Flawless beauty! You’re looking stunning and so elegant in this outfit! That blouse seems like a good deal indeed and loving those lace-up heels, so gorgeous! I love the green and white combo. Obsessed with your hat, and those sandals are so fun for spring! Lovely look, Rach! I love the olive and white together, it’s so unexpected! Loving the olive with the Stuarts! Gorgeous!!! Loving the olive and neutrals combo!! Such an “effortlessly chic” look! Love this look! It’s the perfect go-to or day time look! Olive and white is such a classy color combo! Love that hat! This is such a great casual look! I love that top, and the hat. They’re both perfect neutral colors for spring. This look is fabulous! Love the top! so cute!!! This is totally the outfit I see when I think of Rachel Parcel, effortlessly glam! What a great pair of neutral shoes!! I love this look. You look stunning as always. Omg loving this outfit. Especially the shoes! I need them! Love this outfit and color combination! I love the color! great outfit! Love this look on you!! Definitely something I’d wear too! You are absolutely stunning. Love from Northern Cali! Even though spring is coming close, I still love wearing olive green! Love this color combo – perfect for St. Patty’s Day! I love this neutral look!!! That khaki colour is amazing! You look amazing! Can’t take my eyes off those shoes and that bag. I saw this look on your FB and had to come see the entire post… you are killing it in those heels!!! This is the best. I love wearing similar combinatios! Feminine and elegant! You’re so pretty! I absolutely love following your blog. I hope mine will be as successful as yours! I feel like I’ve know you for awhile :) Thanks for allowing everyone to get a look into your personal life! I agree, skinnies, and the blousy top with heels is a great dressy casual look. I love the white jeans, and those heels are AMAZING. great look! I love this blouse! It is super flattering and I love the loose fit. Your shoes are also gorgeous! Those heels!! So loving this entire look. I am such a sucker for neutrals, you just can’t go wrong! I have always been drawn to camo/olive green! This is definitely one of my favorite spring looks! That hat is perfect and those heel are divine!!! Literally PERFECT from head to toe. This is the best shirt! You just inspired me to get out one I have like it. And the heels are to die for! I love this outfit. Simplicity is the ultimate sophistication. Great outfit! I love the olive green of that shirt, it looks so good with white! Such a cute blouse- it totally does look like Free People! I realy like Sun & Shadow- I don’t know if its a new brand at Nordstrom but I have gotten several pieces there over the last few months. The price point is the best! Love this look! That top is so cute–it’s a great color on you! I love this shade of green clothing. It looks great with neutrals like you have shown here. 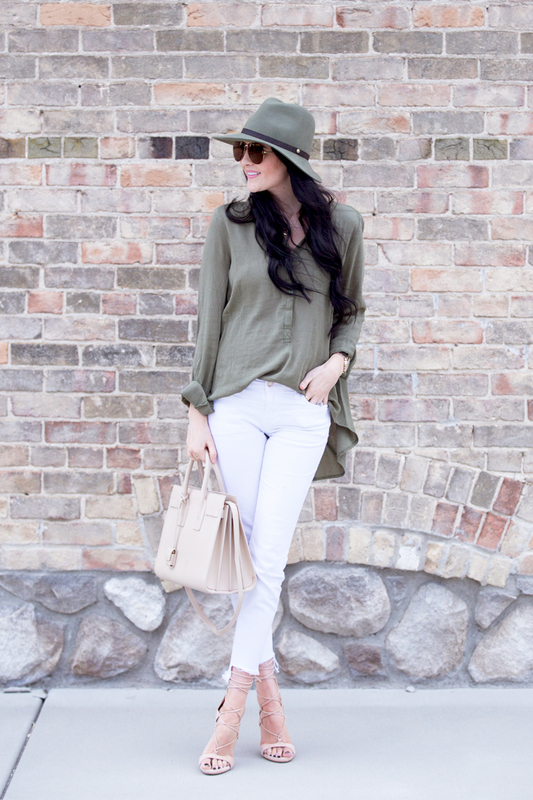 I love how the white pants really brighten this look…very spring. absolutely gorgeous darling, love the color pallet and the match. and your hair! DIVINE! This shade of olive looks amazing on you! I’m also obsessed with those shoes! Gorgeous look! I love those colors together!